Well, here we are, the night before Christmas. As the snow falls gently outside our window, it couldn't be more appropriate to imagine this sign hanging outside on my in-law's barn as the snow falls around it. For my first post, I thought it would be perfect to share a few tips when considering a custom sign for someone. Will it be hung outdoors or in? Will it be for a special location of theirs? Is there something they say or refer to often? Of course, these are just a few, but will guide you closer to something special. For my in-laws, they live on a farm, love to be outside doing just about anything and when you drive up to their farm, you get a warm feeling of a place to relax. 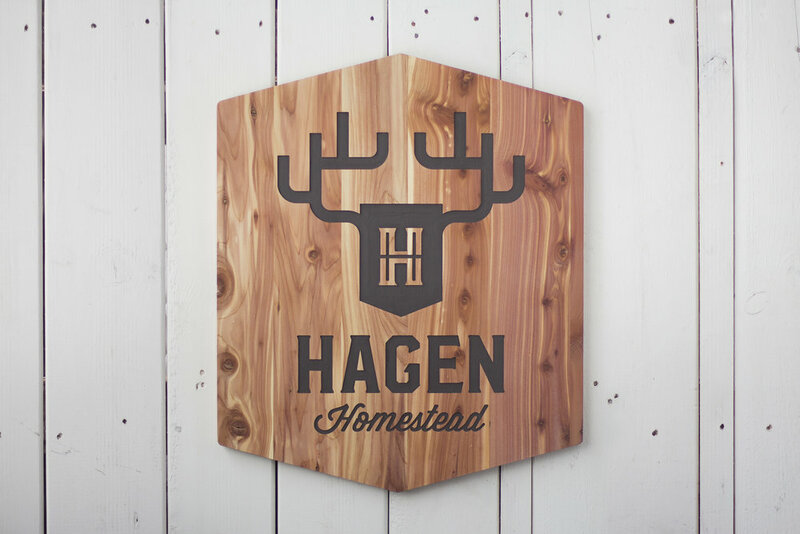 I started by thinking a family 'mark' to symbolize the farm which has been in the family since arriving from Norway. Using the 'H' from their last name, I incorporated it into a classic banner flanked by some antlers. Elk, deer and reindeer are common in Norway and seem to always look cool particularly when used on natural materials. The addition of the word 'homestead' added the warmth I was looking for but was often said by my father-in-law when he referred to the property. Being a spiritual family, the H inside of the H looked like stain glass windows and symbolized their spiritual balance. The sign is made of cedar for use outside where they spend a majority of their time and left unfinished to weather a beautiful gray. The size was around 21" h x 18"w which was a fairly good size to be seen, but not overwhelming. Let's hope they like it!